Its been awhile since I’ve posted anything even remotely political, but as a regular transit rider and supporter of the MTA, I wanted to post this poster produced by the Working Families Party in New York. As any NewYorker already knows, significant fare hikes, and massive reductions in service are set to kick in over the next few months, and its not too late to take action (or at least voice your outrage). 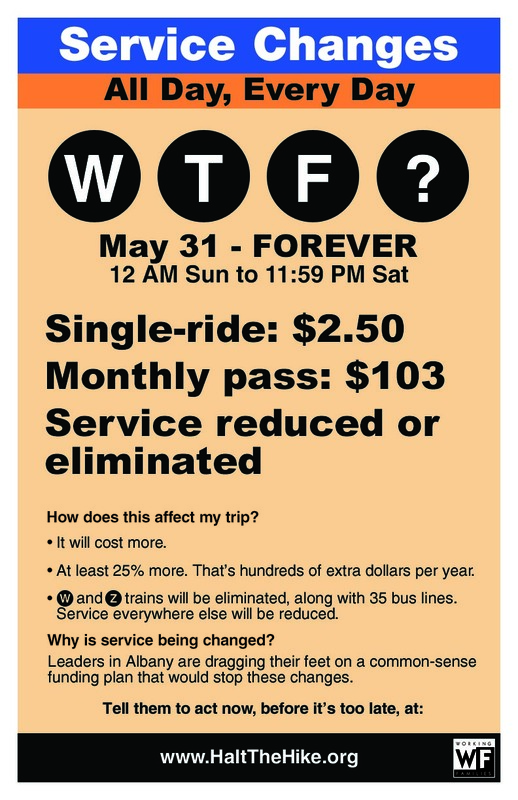 Even if you can afford the fare hikes, there are thousands of people for whom the proposed hikes and service cuts are really, really detrimental, so click on the poster or go to the link below (www.haltthehike.org), print out some of these, and spread them around! Write a few letters to representatives while you’re at it; there’s a form to do just that after the link! I’ve finally gotten around to reading McDonough and Braungart’s influential Cradle to Cradle: Remaking the Way We Make Things, and within the first few pages, I can immediately understand the book’s street cred. The book itself is a polymer–composed of plastics, rather than paper. Its waterproof, and 100% recyclable. However, given McDonough’s obsession with practicality–redesigning simple items like carpeting and shoe soles–I was surprised and disappointed by his willingness to retreat into utopianism. How can one be forward-thinking without being utopian? I don’t know frankly, but I can tell the difference between productive utopianism, and counter-productive utopianism. McDonough (and Braungart; I don’t want to neglect our co-author) manages to do both. In terms of public policy, Cradle to Cradle is, in a word, spectacular! The idea of legislating waste by requiring manufacturers to dispose of the products they produce(a utopian idea, to be sure), I’m certain, if it were ever established, would greatly reduce the amount of heavy metals going into our landfills, and would conversely reduce the amount of virgin materials that we need to expurgate from the earth. Relatedly, I’m afraid that his semi-Orwellian guarantee that landfill mining will be a major growth sector in the coming years is spot on. In addition, the collaborations that he has worked on to produce materials such as recyclable carpet, etc. are noteworthy. His argument against so-called “recyclable” plastics is stunning. Though I had never actually thought about it, I didn’t know the vast qualitative differences that exist between the recycling potentials of glass and plastic. Glass can be melted down and reconstituted forever, essentially. A plastic bottle of water, on the other hand, cannot under any circumstances return as the same plastic bottle. Each time it is melted down and reconstituted, its quality is reduced. Therefore, when you recycle a water bottle, it doesn’t come back as a water bottle; it comes back as a parking cone, or a playground apparatus, or some such thing. In short, the degradation of plastics is absolute. And, when you consider the equally absolute law of the conservation of matter, the frightening realities of our reliance on virgin plastics hits you (or at least it hit me) like, well, a parking cone to the face. All that said, I was left with a very sour taste in my mouth after having finished this book, and McDonough’s excitement over what I would call architectural utopianism, is the sole culprit. In graduate schools across the country, the great utopian thinkers of modern architectural and urbanist thought are taught not as shining examples of forward thinking, but instead are off-handedly guillotined every semester in our graduate classrooms as examples of large scale planning gone horribly awry–Corbousier, Ebeneezer Howard, Frank Lloyd Wright, Louis Sullivan, even Olmstead to a certain extent (see Riverside, IL, not Central Park, NYC). In fact, I would argue that the most infamous of all urban planning quotes was Daniel Burnham’s “Make no small plans. The lack the ability to stir men’s souls” (or something to that effect; I’m too lazy to play factchecker right now). And yet, generation after generation of urban thinkers are prone to the large plan. Its just so glossy, and new, and the answers are so clear and concise, and, “consarnit”, even revolutionary! But, every time, within a few decades, the big plans (Cabrini Green; Civic Centers across the country; cul-de-sacs; pedestrian malls) are exposed as careless, under-nuanced and over-funded, and prone to political or social collapse. And, yet the circle continues as McDonough has fallen into the same glittering trap. Instead of towers in the park and garden cities, McDonough gets all twitterpated about his grand plans for sustainable cities: huge plans for huge cities, sweeping changes, a new paradigm for urban design, lots of fancy graphs and artistic renderings of perfectly manicured green-roofed cityscapes and aerial views. And ooh, look at that fancy powerpoint! I wanted to just stand up and say (despite this being a book, and there being nobody to complain to) “How?” In China, where one of his major projects is located, he flings up these fancy pictures on the page, and doesn’t bother to mention basic political hurdles such as, I dunno, land ownership, cost, or god-knows-what-else. I guess I just don’t trust that kind of thought. Its one thing to plan a perfect city in your head where everyone acts rationally, and you can save the world through urban design, but to implement it verbatim frightens me. The new urbanists (the darlings of progressive urban planning theory in the mid-nineties) are learning this fact now. 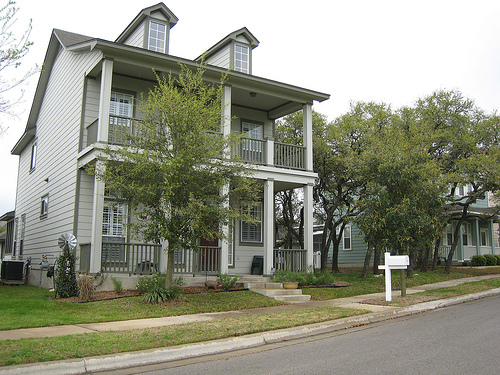 You can require front porches in newly built neighborhoods (and they look mighty fancy!) but nobody is going to sit on them. Nobody is going to sit on their stoops, because there’s no reason that people should. The fall of close knit communities was not linked to the departure of the front porch from American architecture; it was caused by two primary inventions–television (the lesser of the two) and air conditioning. And new urbanists suggest that people can keep their TV’s and sir conditioners, just as long as they have sidewalks and front porches. Its a joke! The only thing worse than a house without a front porch is a house with a front porch that’s never used. That’s the problem with McDonough. All of his micro-analysis is wonderful, but his translation from treatise on waste to manifesto on the future of architecture doesn’t reflect the political, social or economic complexities of urban environments. In short, I’ll recommend this book to anyone. However, I will recommend that they put the book down when McDonough unveils his bright, shiny, perfect sustainable city. I generally avoid things that are bright and shiny to begin with; things that are perfect are outright dangerous. Urban Agriculture Conference in Milwaukee. At the end of this month, a number of local activist and education groups will be holding a national urban agriculture conference: “Pollinating Our Future.” This occurrence, at this time, in this fine city is (at the very least) fortuitous. As anyone who knows me can attest to, urban agriculture and urban food systems are my primary activist concerns, and I am in the middle of an independent study through which I hope to devise an avenue for urban agriculture as an economic development strategy in cities like Milwaukee. As anyone who lives in a large American city can attest to, a sort-of food revolution has begun in small populations of Americans: whites with a certain level of income. However, the people who would be best served by an agricultural revolution that values quality over quantity, localism over the international trade of perishable food items such as rock hard tomatoes, wilted bell peppers, and iceberg lettuce, and an emphasis on seasonal eating, are being left out: the poor. As incomes have dropped in America’s inner cities, vicious cycles have begun to develop as regards goods and services. Hospitals in inner cities (St. Michael’s in Milwaukee) have been forced to close and move to the suburbs in search of greater profitability, which is a different injustice for a different post altogether. And grocery stores have also moved to the peripheries of metro areas, leaving inner city residents–who largely get by on public transportation–without an affordable source of quality foods, and without a reliable source of health care: the brutal combination of which has had a devastating effect on the well being of millions of Americans in the form of increased Type II diabetes, asthma, etc. As usually happens when we let the falsely titled “invisible hand” of capitalism rule over the business community, the poor are continually under-served. I believe that urban agriculture can provide good jobs, increase education among populations of Americans that no longer understand the value of good food or the consequences of a poor diet of processed food, decrease the cost of food for inner city residents (through decreased transportation, preservation, processing and handling costs), increase the availability of good food, help the city economy as a whole through import-substitution, and by providing an outlet for municipal waste (compost) that will help to close the nutrient loop that has been painfully, catastrophically severed since the onset of public sanitation. If that last paragraph was a bit jargonistic, my apologies, but honestly, if things are going to be genuinely changed, they need to be attacked from technical (rather than amorphous, hippy-dippy, earth mother, divisive) language. Essentially, y’all should take a look at the conference website, check out the types of sponsorship organizations, speakers and workshops that will be happening. Its a good way to start understanding the causes of urban degradation in America, and to start looking at ways to remedy some of those neoliberal policies that have led to the shrinking middle class, the privatization and financialization of services, the resulting lack of accountability when the private sector gets involved in urban public policy formation, the increased efforts to get Americans to take on debt, and a number of other things that we as a society have refused–out of convenience, primarily–to see correctly: both the forest and the trees. 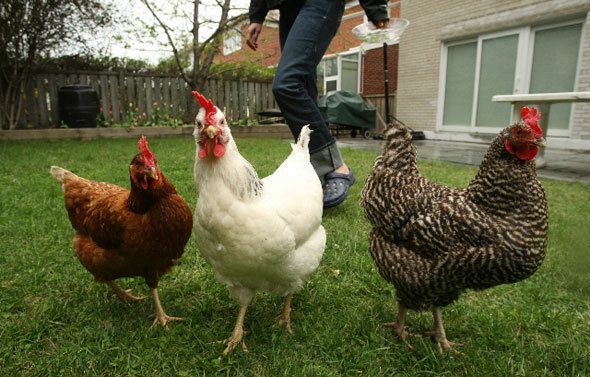 In addition, I will be adding to the links section of this site a number of urban agriculture websites and organizations that are helping to educate the public, that are trying to convince people that the separation of agriculture from cities, from urbanity was a catastrophic, artificial imposition. Accountability issues in New Orleans? Go figure. On the New York Times website today was an articleabout the failed effort by thousands of New Orleans residents to hold the Army Corps of Engineers resoponsible for the flood damage to the homes and properties affected by the three seperate levee breakages soon after Katrina. Read the article, and read the Judge’s statement. 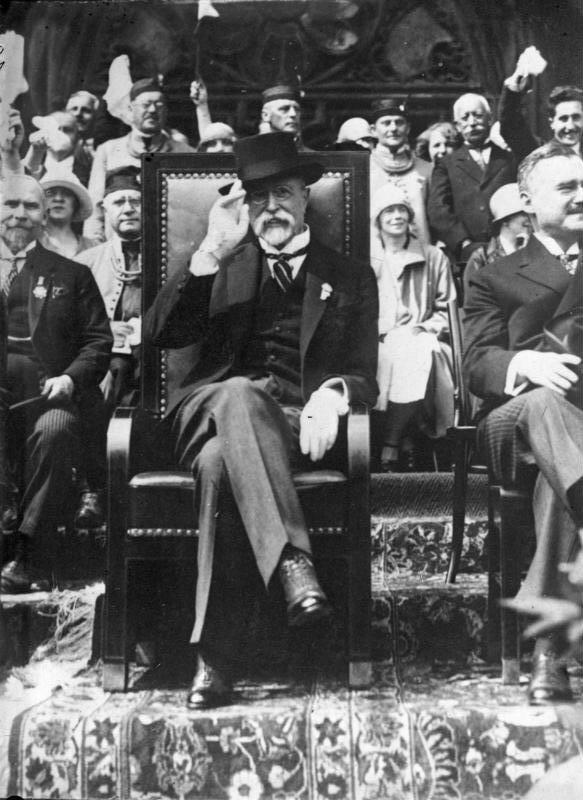 Though I approve of his language in chiding the Corps for a number of magnificent failures–both calculated and unknown, the fact that he was powerless to rule against the Corps on the basis of an 80 year old law (the Flood Control Act of 1928) is despicable. For a state to forcibly divorce itself from any legal liability shows the real lack of public accountability that the U.S. Government has to its citizens…as though that hadn’t been proven a mere two days after the hurricane! Read the judge’s dismissal order. The flaccidity of the decision (due to the Flood Control Act) is genuinely depressing. In all seriousness, how else than by an unjust law can a passage like the one below occur in a dismissal order? “This story–fifty years in the making–is heart-wrenching. Millions of dollars were squandered in building a levee system with respect to these outfall canals which was known to be inadequate by the Corps’ own calculations. The byzantine funding and appropriation methods for this undertaking were in large part a cause of this failure. In addition, the failure of Congress to oversee the building of the LPV and the failure to recognize that it was flawed from practically the outset–using the wrong calculations for storm surge, failing to take into account subsidence, failing to take into account issues of the strength of canal walls at the 17th Street Canal while allowing the scouring out of the canal–rest with those who are charged with oversight.